One of my adult students has a violin which sounds beautiful, and I covet it. Now he has something else interesting. One of his friends had a father, now deceased, who was a professional symphonic violinist. The friend had his father’s violin and bow put in a sealed glass case which he hung on his living room wall. (Ouch!!) The friend has another one of his father’s bows, and he offered it to give it to my student, who gladly accepted it. My student took it to the luthier for rehairing and general appraisal. The luthier said that it was in good condition. He couldn’t say how much the bow was really worth because he didn’t know the maker, but he estimated, by looking at the quality of the materials and the craftsmanship, that it was worth $800-$1200. Nice gift! When I heard my student play his violin with his new bow, the sound was even more beautiful than it had been before. I asked him to let me try it, and the result was disappointing. It felt strange and heavy in my hand. I tried to play with it, but I couldn’t tell how to maneuver it. In my hand, it was essentially dead. I know that getting the right bow to go with your own violin and your own hand is important, and this was such a dramatic demonstration of that requirement. As I wrote in my blog dated Sept. 7, I was very happy with my new Infeld red strings, but the G string sounded a little fuzzy. Karen Allendoerfler wrote that she had a similar experience. She changed her G string from an Infeld Red to an Infeld Blue and got rid of the fuzziness. I tried it, too, and the results were great. From the moment I first played the open G string, I knew that the sound was much better, more clear and sweet. Thanks for your advice, Karen. Some of the songs are Camptown Races, Angelina Baker (the only love song I’ve ever heard about a woman 43 years old), Soldier’s Joy, Red Wing, and Bonaparte’s Retreat. The book also has explanations and short exercises on such topics as the low second finger and high third finger. This book proves that you can learn and have fun at the same time. I recommend it highly. I tried and tried to think of a connection between kings and music, and then I remembered that Elvis is the King. Something special happened to me when I was 9 years old. It continued for several years, and its influence has lasted all my life. It was the first in a series of TV shows called Leonard Bernstein’s Young People’s Concerts. I looked forward to each show with great excitement, and I was thrilled each time I saw one. Some of these TV shows were released a few years ago as a special collector’s edition 9-DVD set. It costs way too much for me to buy, and my local library doesn’t carry it, so I thought I’d never get to see it. One day a few weeks ago, a friend told me that her husband had bought the DVD set. I got really excited and asked to borrow one or two DVDs. My friends were about to go on vacation, and they left me the whole set while they’re gone. My reaction was just like the one I experienced as a kid many years ago. I look forward to each show and feel thrilled each time I see one. I knew that Leonard Bernstein was a gifted conductor and composer, and now I know that he was a gifted teacher. Even though he glanced at his notes occasionally, he spoke with his eyes on the audience most of the time. He spoke with the confidence of an expert and the passion of an artist. He never spoke down to his audience, most of whom were children, although he was careful to explain big words and sophisticated concepts. From time to time, the camera showed the audience, and the children were focused and rapt on Bernstein and the musicians. The kids appeared to hang on his every word, and Bernstein educated them well. I wonder how today’s kids would react to the videos. They are black and white with no cute, animated figures or high tech antics. The power of Bernstein’s insights and the playing of the orchestra are what it’s all about. Seeing and hearing Bernstein conduct the New York Philharmonic was worth the price of the DVD set. Their music was simply fantastic. Seeing the videos as an adult with experience playing in community orchestras was very interesting. Bernstein appeared to become the music. His facial expressions and hand and body movements communicated the spirit of the music, as he felt it, very well. It would be very easy to follow him as a member of the orchestra. The “What Is Sonata Form?” is just one hour long. The DVD set has nine DVDs with three one-hour shows on each disc. There is a wealth of information and enjoyment here. Leonard Bernstein is a very gifted teacher, and I’m hooked on the series. I heartily recommend this set of DVDs – especially if you can get them on loan from a friend. This is like a soap opera, but it’s about a day in the life of a violin teacher. Student #1 did not come for her lesson, but she had told me about this in advance. No problem. Student #2 is a novice, adult beginner. She went for two weeks without a lesson and didn’t practice even once. I had to start all over from scratch. I gave her a lecture on the necessity of practicing. Student #3 cancelled because he is swamped with schoolwork. Student #4 had to cancel because he is sick. A lot of kids and adults get sick when school starts and germs are passed around. Student #5 is a sweet, talented, and motivated student, age seven, who has been taking lessons for less than a year. She has not come for a lesson in a month because of vacations. She only practiced today, just before her lesson. She sounded great! Amazing! I had to make a few corrections, but on the whole, she played beautifully. Student #6 is an adult beginner who practices regularly and has a good “sense” of music. Before he left, he thanked me for a “fun lesson.” We worked hard, and I’m glad he thought it was fun. Student #7 is an adult beginner who is very musical and he, too, practices regularly and enjoys it. He stopped taking lessons from me a few months ago because of upheavals in his and his wife’s lives. Today I got an email from him telling me that most of the uncertainties have been resolved. Also, his wife is pregnant, and they’re both thrilled. He has been practicing his violin and enjoying it, and he’s now ready to resume lessons with me. I was so happy with the Infeld Reds I put on my violin1 (see my blog dated June 10, 2007) that I decided to try them on my violin 2. My violin 2 is a nice instrument made in Germany ca. 1900. It has a warm, sweet, well rounded tone on every single note. That’s why it’s my violin 2; its sound lacks personality. I was curious enough to find out how it would sound with Infeld Reds that I scraped up the money and bought a set of them. After I put them on my violin and started to play, I had a surprise: I felt like I had a new bow. I tried the various maneuvers I use for testing a new bow, and they all worked better with my “new bow.” Of course, the bow wasn’t new. The strings were just more responsive. Then I did a little test to see how much finger pressure I needed to stop the strings, and I found that I could use less pressure than I had in the past. The sound of the open E string didn’t thrill me as it did on violin 1, but all the fingered notes I played on the E string thrilled me. The G string sounded just a bit fuzzy, but not very bad. My favorite strings on this violin are the middle ones, A and D. They have a rich but clear sound. 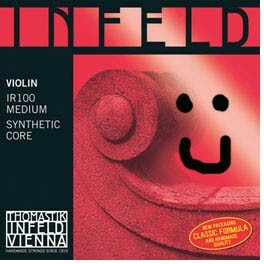 So my violin 2 does have more personality with the Infeld Reds. I still prefer violin 1, but I play violin 2 more often than I used to. It’s more fun with its new personality. The great Italian tenor Luciano Pavarotti has died of pancreatic cancer at age 71. He is remembered as an opera star, a member of the Three Tenors, and a collaborator with such popular groups as the Spice Girls. Pavarotti retired from the opera stage in 2004 but was on a farewell tour of concerts in 2006 when he was diagnosed with pancreatic cancer and underwent immediate surgery. For more information see CNN news or Yahoo news.